I did not hate vegetables when I was a kid. But I was not really fond of them either. I just did not have any special feeling about them. They were just there in every meals, as an essential dish in a traditional Chinese meal. And the ways that they were cooked by my mom were very similar; stir-fry plain by itself or with some meats, adding some soy sauce or oyster for seasoning, or adding salt only. Sometimes, my mom also liked to boil, not steam, the vegetables in some flavored broth or salted water. When they were tendered, just poured some soy sauce or oyster sauce on top. That is the quickest and easiest way to make cooked veggies Chinese style. Not until the time that I lived by myself in Canada because my parents sometimes went back to their homeland to stay for an extended period of time that I started to cook for myself. I was so busy and lazy at that time that I skipped the veggie dish sometimes. But I found out very quickly that there was something missing in my diet. I felt that I did not have a full meal. When I started to make vegetable dish again, I realized how important it was. The natural sweetness from the juice of the vegetables are magical. They help me to feel refreshed and revitalized my body. From then on, I hardly ever skipped my vegetable dish again. Even though I like almost all types of vegetables, zucchini is never my favorite kind. I do not like to eat them raw as salad and if making stir-fry with it, the flavor get buried with all the sauce and the meats. They are never the star of the dish. But once I explored outside Asian cooking, I began to like it more and more. 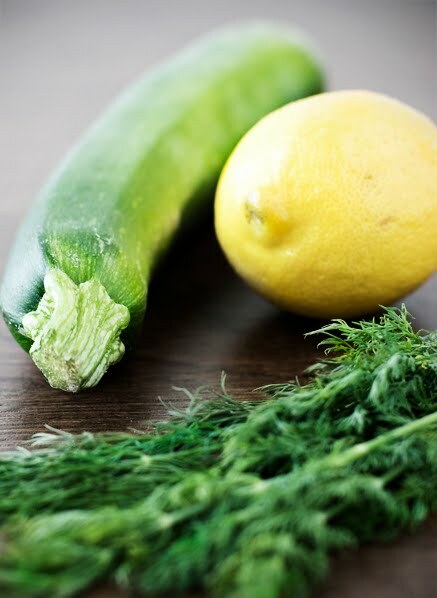 The followings are two of my favorite zucchini recipes. Simple but delicious, with zucchini as the star of the dish. The first one is a Mexican flavored Zucchini and Corn Saute. 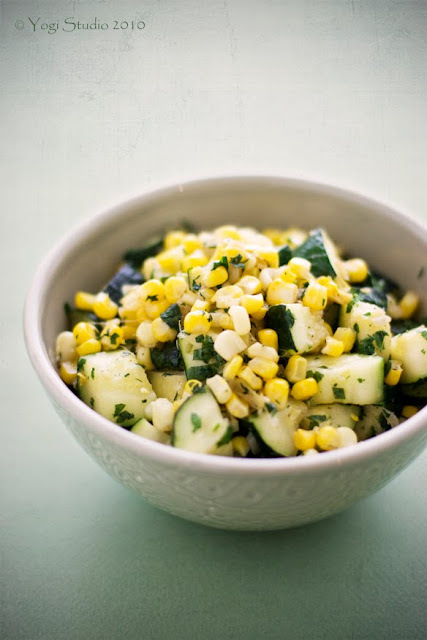 The cumin and cilantro greatly enhance the flavor of the zucchini, accompanying by sweet corns, every bite is filled with the sweetness and juiciness of these two vegetables. You can use frozen corns if you want to make it quicker. But fresh corn really makes a difference in the taste of this dish. Heat oil in a 12" heavy skillet over moderate heat until hot but not smoking. Add shallots, stir and cook until softened, about 3 mins. 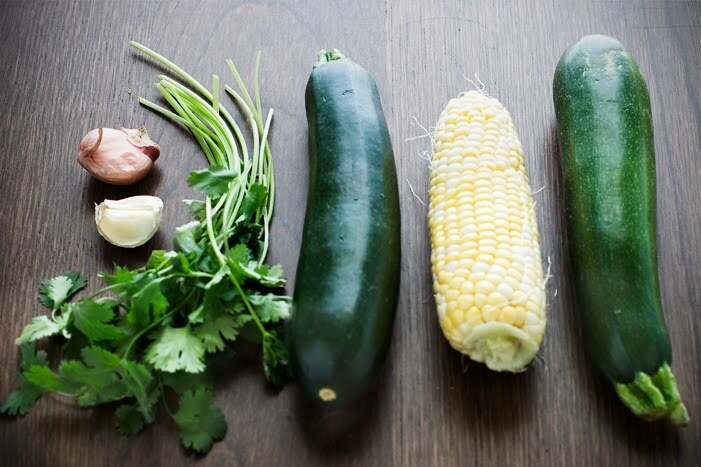 Add garlic and cook until fragrant, about 30 sec.Add zucchini and 1/4 tsp salt, stir and cook until zucchini is half cooked, about 4 mins, Add corn, cumin and cayenne, stir and continue to cook until zucchini are softened to a degree that you prefer, about 1 to 2 mins longer. Stir in cilantro. Adjust taste with salt and pepper. *If using fresh corn, you can rinse the corn with water and wrap them in saran wrap. Microwave for 2 to 3 mins. Then cut out the corn. The second dish is even more easier. It is a great side dish for meat or fish. The recipe is originally from Martha Stewart Everyday Food magazine but I forgot which issue it is. As with lots of other recipes in this magazine, you follow the instruction once and then do not need the recipe anymore. Here is my adaptation of the recipe. Heat oil in a 10" skillet over medium heat. 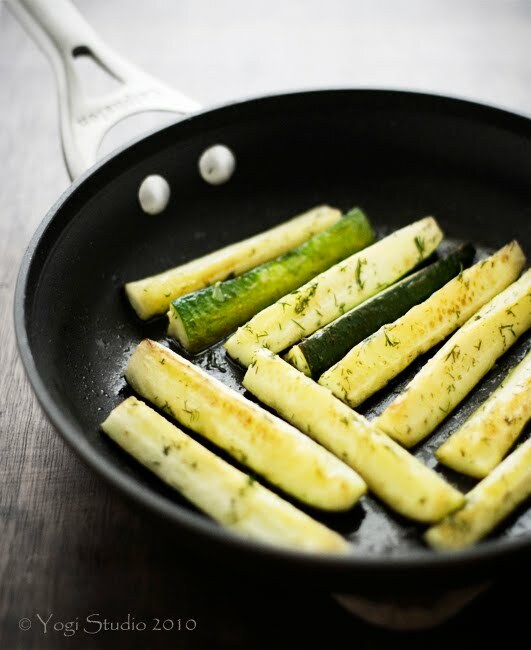 Add zucchini strips and a pinch of salt, cook until golden brown on all sides, flip occasionally, about 6 to 8 mins. Add lemon juice and fresh dills, toss a cook for another minute. Season with salt and pepper to taste. I usually add quite a bit of salt to balance the lemony taste. Love love love zucchinis. But still have to wait for corns to show up in season. I hated all vegetables when I was a kid, but now I love them. I think zucchini, in particular, is awesome. I can't wait to try the saute with the corn!! Egle - Corn started to show up here in Vancouver already, although it's still a bit early in the season, but they were very sweet. whisk-kid - Good, I know you do like green stuff, otherwise you wouldn't make your green frosting cupcakes. 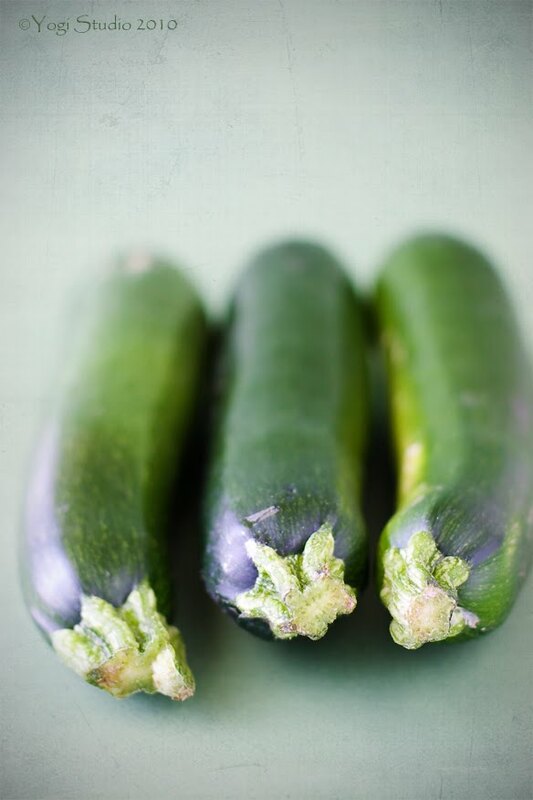 I can't get enough zucchini during the in-season months, and both of these recipes sound delicious and healthy. I can't wait to try them! Very nice veggie dish. The two together make a delicious side. I love both dishes! Oh yum - I'm especially intrigued with the first one. Lauren, lisa, Tanya - Thank you for dropping by. I hope you'll like the dishes. I have developed a great love for zucchini. It's one of my favourite vegetables now!! These recipes look absolutely wonderful. I can't wait to try them. This is a beautiful recipe! I would love for you to enter it to our 8th monthly veggie contest. This month's theme vegetable is corn! omg this is going in my bookmarks. i absolutely love zucchini. i also like corn niblets! yum!